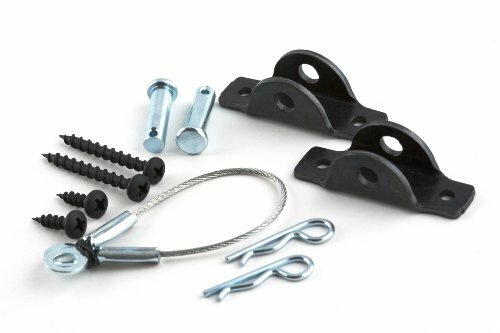 He Hangman Furniture Anti-Tip Kit consists of an aircraft grade steel cable that connects on one end to your furniture with a bracket installed into a stud on the wall. There are 5 ball slots and 6 hooks for you to organize your cleaning tools all in one small space freeing up your floor space. We promise all payment back if you are not satisfied with this product. Simply insert a handle into a slot and a rounded, gravity controlled, rolling ball automatically adjusts to the handle's thickness and grips it securely. Use in the laundry, garage, garden, utility room, offices, and more. 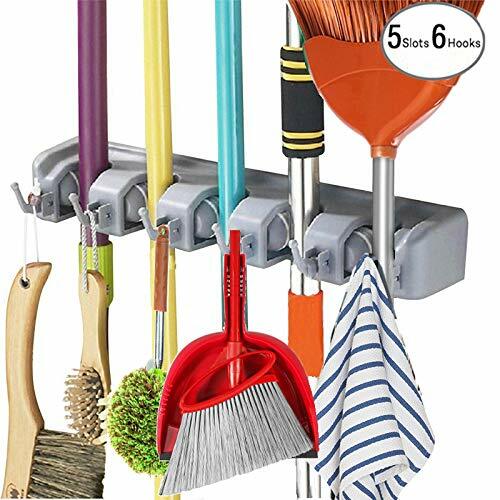 Strong and sturdy - The mop and broom holder organizer is made of tough plastic, which can hold up to 22 lbs in total. Each ball holds up to 7-1/2 pounds of weight. Broom and Mop Holder Wall Mounted with Screws Drilling Installation - Fit to Wall Easily and Never Worry The Hanger Will Fall Down on The Next Morning. Compact Size for Saving your Space - The broom hanger Organize your broom closet, kitchen, garage, garden, basement, or laundry room with this sturdy and versatile storage solution. Also idea for garden and yard tools racks storage and organizer. Easy to install and use - The friction-grips clamp down securely on broom/mop handles, adjusting automatically to the handle's thickness. And release instantly when the handle is lifted. Can easily hold heavy tools with a no-slip grip, and will also withstand extreme temperatures, so can be used outside and inside. Prevent large pieces of furniture from tipping over, when properly installed, with this Furniture Anti-Tip Kit! An aircraft grade cable and two steel brackets connects dressers, curio cabinets, chests, entertainment centers, and more securely to the wall. 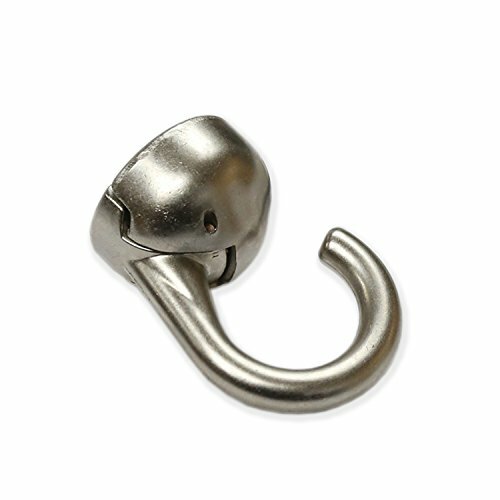 Includes a quick-disconnect clevis pin for easy cleaning behind and around furniture. Rated for up to 400 lbs. Helps prevent furniture, filing cabinets, and full length mirrors from falling over. Warranty: 5 year limited warranty. Warranted against material defects. Hangman Products will replace any broken or defective unit. No other warranties are offered or implied. Add mobility to your Seville Classics UltraZinc Shelving System! 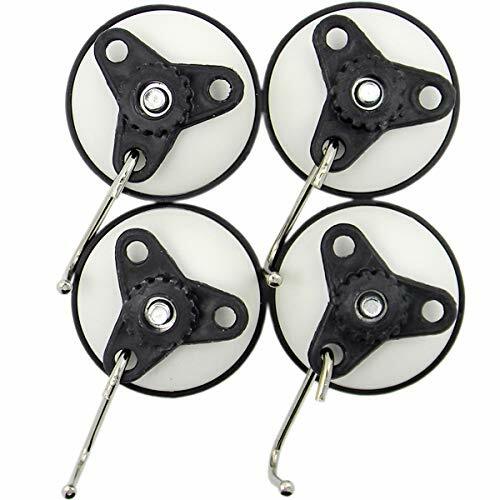 These 3-inch casters provide additional mobility to 1" pole diameter shelves. Each wheel measures 3 inches in diameter and is constructed of black polyurethane. 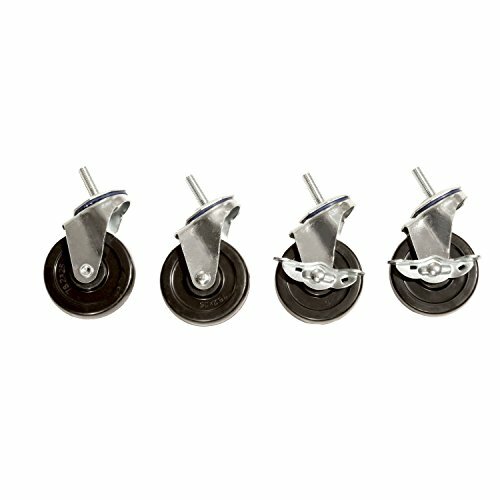 Metal hardware with ball bearings allow the wheels to swivel while rolling for reliable, predictable control. Two of four wheels feature a locking brake that can be toggled by foot. Move your storage where you need it and set the brakes so it stays where you put it. Installation is easy; simply screw the threaded stems of each caster into the base of the shelving legs. Horizon over the seat hard hat rack. Hold all manufacturers hard hats regular, wide brim and cowboy hat style. 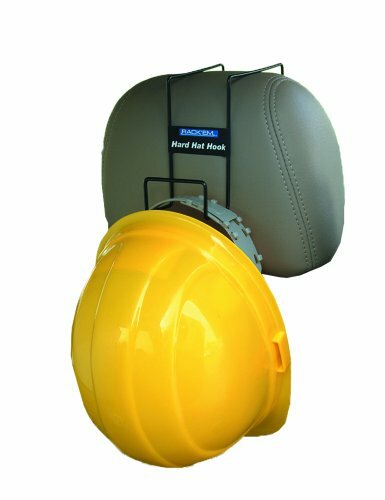 Secure hard hat safely in vehicles comply with ANSI Z89.1-1986 carrying and storage of head protection recommendations. Sturdy steel construction. For use in passenger vehicles or pickup trucks. Measures 2-1/2-inches width by 2-1/2-inches height by 2-inches depth. 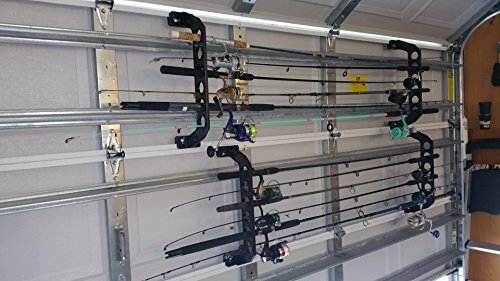 Introducing The 21" Cobra Garage Storage Rack for 4 panel garage doors, the best solution to store your finest fishing rods in the unused space on your garage. The Cobra Storage Rack rack easily installs in minutes without tools on most standard 21" garage door panels. If you have an insulated garage door which do not have the lips for clamping you can hard mount it to the insulated panel with self tapping screws or they can be installed on your walls or ceilings. The Cobra Racks are made in the USA from durable, high strength ABS materials, the Cobra Storage Rack is the perfect solution for your garage storage efficiency needs. Please check size of garage door panels for 21" Cobra Racks as it may need the Cobra 18" Storage Rack. Count the panels, if it has 4 panels it usually requires the 21" Cobra Rack, if it has 5 panels it requires the 18" Cobra rack. 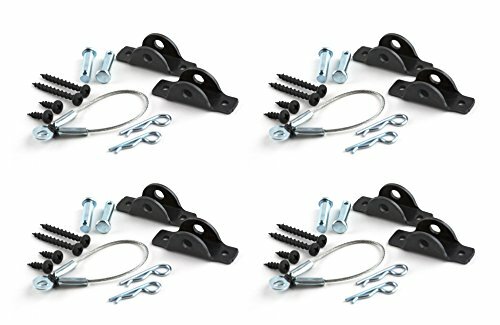 Each package includes 1 set of Cobra Racks with clamping hardware on standard garage door panels.Insulated panels require self tapping screws (not included). All hardware included for easy, no tool, installation on standard garage doors. If the door is a hard insulated or wood door self tapping screws are not included but can be shipped at no cost. 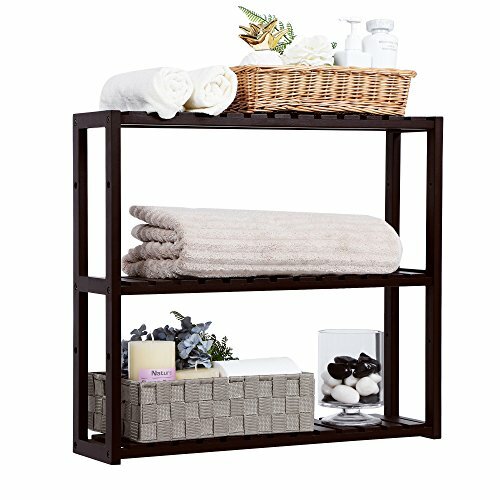 MULTIFUNCTIONAL BAMBOO RACK: 100% natural bamboo, and sturdy; 3 tiers bamboo rack & storage shelf for toiletries, towels, sundries, decorative things, Knick knacks, shoes, books, plants, spice and small appliances in bathroom, living room, balcony, kitchen, etc. You can simply screw into a wall by the holder of high-quality spring steel. With only a click holder, it keeps your shovels, brooms and other gardening to a stem thickness of up to 5cm secure. 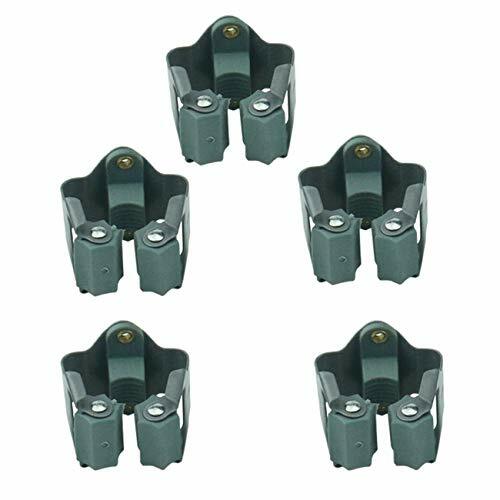 You can find the device holder use in garages, sheds, garden sheds and even in homes. - With a click secure hold. - Clear arrangement of household and garden equipment and tools. - Long lifetime through high-quality processing. - The abrasion-resistant rubber rollers and buffers guarantee a long lifetime. - 5 position wall organizer for handled tools. - Easy release by lifting the handle, rolling balls automatically adjust to each handle's thickness and grips it securely. - Holds Wide Variety of Tools: Not only organizes brooms, mops but any tool with a hook. - Each ball holds up to 7 pounds of weight. Do not use this for rakes and shovels. they will be too heavy. - The diameter size of broom/mop handles fits: 18mm - 28mm. - Attached to the wall by screws. - Mount brooms, mops, shovels and rake easily, instead of leaning the brooms to the wall and in the corners. 5. Hang up your broom or tools. 5 position wall organizer for handled tools. With a click secure hold. Clear arrangement of household and garden equipment and tools. LIANTRAL water jug rack made of iron baking varnish, which was solid, durable and elegant appearance. Can be use in home, kitchen, breakroom, store room and fits virtually anywhere. 5. Use in Home/Kitchen/Store Room, etc. SELECTED MATERIAL The water jug holder made of premium steel, durable and steady. it's easy to put together and no tools required. NO FLOOR DAMAGED This water cooler rack comes with 4 plastic mat, keeping the 5 gallon water jugs off the floor prevents the floor from scratching or buffing. DETACHABLE DESIGN The water rack can be detached if you need to place them in a different places. These are available in 3-tier, 4-tier and 5-tier(Dimensions please check the pictures). SAVING SPACE The standing water jug rack keeps your water gallons off the floor and helps you save floor space to keep it neat and clean. Can be used at Kitchen, Breakroom, fits virtually anywhere. 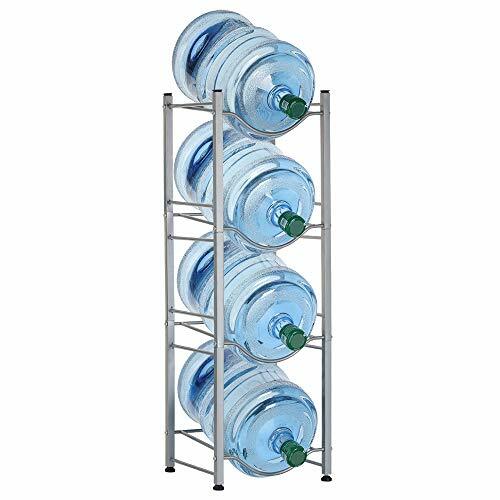 GUARANTEE LIANTRAL water bottle shelf rack provide 45-day free refund and 90-day free replacement. So if there is any quality problem with our product, please just come to us and we will give you a fast response. We promise it is the best quality. These powerful vacuum suction hooks feature the unique power inner thread lock design that creates maximum suction on smooth clean surfaces.could more than 22LB.great for hanging shower and bath accessories in a bathroom or kitchen utensils and tools on a tile backsplash.make from ABS plastics,rubber material;Metal hook length :4.7 CM; Suction Cup diameter:5.3 CM. 1. To ensure best performance,before installation need to fully clean both the suction cups and smooth surface. 2. If the suction become deformation or harden up because of cold weather, soak in 50 degree hot water for 10 minutes first, dry up then push agaist the smooth surface. 3. Firmly push the suction cup against a cleaned surface turn tri-wingnut clockwise until it will no longer rotate. Insert the steel hook in one of three holes. 4. To release the suction seal, turn the tri-wingnut counter-clockwise and release. 5. DO NOT suitable for surfaces such as cement, ceramic tile juncture,plasterer, metope paint, latex paint, wallpaper metope, archaize brick, ceramic tile of aging, tiles with slightly craze and dark grain. Note:Shells Group are always willing to work things out to meet your satisfaction. We value every customer and guarantee satisfaction. please feel free to contact us the first time you got questions about our products.please kindly aware of all Shells Patent item should with a special package,Shells Group will not responsible for any bad quality items that you buy from other sellers. With strong inner thread lock and high quality natural soft suction rubber could holds up to 22LB. Reusable and waterproof desig.easy to remove, no tools required. Works great on smooth non-porous surfaces such as tile glass fiberglass. 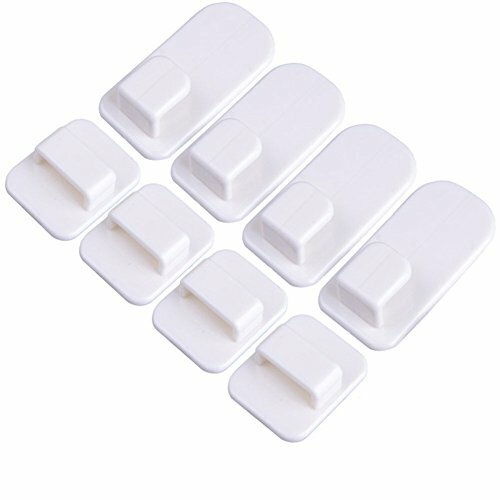 Package including: 4PCS white sunction hooks. What does this SONGMICS DIY adjustable shoe rack have to offer? 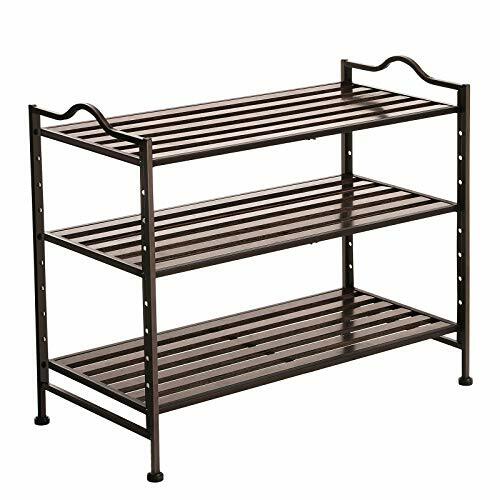 Heavy-Duty Shoe Organizer Composed of integral metal side frames and slat fiberboard shelves, the shoe rack is stable and durable to last for years to come. Slat shelves provide essential ventilation. Adjustable, Stackable and Expandable This 3-tier shoe rack provides adjustable shelves for keeping flats, boots, high heels, kids shoes. Two sets can be stacked or placed side by side to create a large capacity shoe rack and fit your space. Versatile Storage Shelf You can place this rack anywhere you want, such as in the entryway, closet, garage, living room or mudroom; also great as a storage shelf for dry food, books, games, toys, craft supplies, etc. Will you find any more possible uses? Just find out yourself with this SONGMICS versatile utility rack. Specifications: - Color: Bronze, vintage - Material: Powder Coated Iron Tubes, Medium Density Fiberboard Slats - Product Size: 27 L x 12. 2 W x 22 H (68. 5 x 31 x 56 cm) - Weight: 8. 1lbs (3. 68 kg) - Max. Load Capacity of Each Shelf: 22 lbs (10 kg) Package Contents: - 1 x Shoe Rack - 1 x Instructions SONGMICS Note: - Don t sit on the product or put overweight items on it.